Laura Biagiotti was born in Rome under the sign of Leo in 1943, is one of Italy’s greatest fashion designers. Since 1980 she has lived and worked in the Roman countryside, in the 11th century Marco Simone Castle that was lovingly restored to its ancient splendor after years of patient renovation, together with her husband Gianni Cigna, who passed away prematurely in August 1996. Laura Biagiotti’s interest in fashion began in the Sixties when she followed in the footsteps of her mother Delia Soldaini Biagiotti, the founder of a fashion atelier. Laura Biagiotti is famous around the globe for her extraordinary fashions: the New York Times dubbed her the “Queen of Cashmere” due to her love for this precious yarn that she has used since her first collection with a refined, unusual approach, evolving into a dimension of style unheard of at the time. Laura Biagiotti is considered the Ambassadress of the Italian Fashion around the world, for having started commercial and cultural relationships in many countries. On April 25, 1988, a unique event in fashion history took place in Beijing, when 30 Chinese models presented the most significant creations in the career of Laura Biagiotti, the first Italian designer to stage a fashion show in China. Approximately 125 outfits paid homage to the precious raw materials for which China has been rightfully famous for centuries: cashmere and silk.On February 5, 1995, the legendary doors of the Great Theater of the Kremlin opened to Laura Biagiotti: the first Italian designer to stage a fashion show in Moscow in the old headquarters of the PCUS. Her fashion show was an event that linked Italian fashion and culture with the great Russian nation. In 1997, Laura Biagiotti was invited to bring her fashions to Cairo for a charity benefit organized by the Egyptian Red Cross. The “Biagiotti Day” was celebrated on July 13, 2004, and for the first time in her career, Laura Biagiotti presented her fashion show in Rome on the Piazza del Campidoglio.An important event for Biagiotti Group and children’s fashion took place in November 2006 in Dubai: the Laura Biagiotti Dolls collection presented its first fashion show in the United Arab Emirates and was a huge success. In 2010 Laura Biagiotti has been invited to exhibit some of her most significant creations at the Italian Pavillion of the Shanghai Expo. AwardsIn 1992, she received the Woman of the Year award in New York. In 1993, she received the Marco Polo award in Beijing for having brought Italian industry to China. In 1995, she received the Knights of Labor award from Italian President Oscar Luigi Scalfaro for her long career in the fashion industry and her contribution in making Italian fashion famous worldwide. 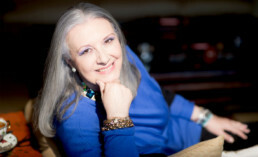 Laura Biagiotti was the President of the Leonardo Committee, composed of prominent Italians in the fields of industry, art and culture, from 2000 to 2008, and became its Honorary President in 2009.In 2001, she was the first designer to receive the prestigious Prix Femmes D’Europe for her contribution in promoting women’s participation in the development of a unified Europe.Laura Biagiotti is the first fashion designer to have compiled a chapter on Italian fashion for the Treccani Encyclopedia in the Book of the Year 2004.In July 2004, Rome Mayor presented Laura Biagiotti with the Lupa Capitolina award during a day rich in events devoted to the designer and motivated by her great love and knowledge of the Eternal City. In September 2007, she received the Crystal Lion Lifetime Achievement during a gala evening held at the conclusion of the 64th Venice International Film Festival. In January 2011 she was appointed by the President of the Italian Republic Giorgio Napolitano the Leonardo Award, that for the first time in history has been given to a woman who is a shining example of Italian excellence worldwide. In 2012, Laura Biagiotti celebrated the 40th anniversary of her career, having made her debut with her first collection in Florence in 1972.In 2013 she received at the Galleria Nazionale d’Arte Moderna in Rome the Arte: sostantivo femminile Award, for her great passion for art. In 2015 she received a special career award “Premio Roma” and in 2016 the “Premio 100 Eccellenze Italiane” for her great involvement in the promotion of the Made in Italy. Fashion & Art Laura Biagiotti is constantly involved in promoting Italian culture. After restoring the Marco Simone Castle, she sponsored the restoration of an embroidered cope kept in the Poldi Pezzoli Museum in Milan, whose design proved to be an authentic Botticelli. In 1998, with the support of Laura Biagiotti Parfums, Laura Biagiotti restored the Cordoned Staircase of the Capitol, which was designed by Michelangelo and is considered the heart of Rome. In 2003, Laura Biagiotti Parfums donated the new stage curtain, dedicated to Gianni Cigna, for the Fenice Opera House in Venice after the original was destroyed in the fire. Laura Biagiotti and her husband owned the largest private collection of paintings by Futurist artist Giacomo Balla, gathered during their intense and passionate years of art collection. This collection, which is a part of the Biagiotti Cigna Foundation, was exhibited at the Pushkin Museum in Moscow in 1996 and in 1998 in the Bramante Cloister in Rome.From April 2017 to June 2017 a precious selection of 116 (out of 300 artworks of the entire collection), of the most popular and significant masterpieces by Giacomo Balla of the Biagiotti Cigna Foundation has been exhibited at the Estorick Collection of Modern Italian Art in London. Since 1999 Laura Biagiotti has signed a special exclusive agreement and became official partner of the Piccolo Teatro Studio in Milan, where all the Laura Biagiotti fashion shows take place.In February 2007, Laura Biagiotti, together with the Minister for Cultural Heritage Francesco Rutelli launched the restoration project, sponsored by Laura Biagiotti Parfums, for the Fountains of Piazza Farnese in Rome. In December 2009 the monumental Giacomo Balla’s Genio Futurista Masterpiece, a fundamental work by the artist that has not been put on show for over thirty years, has been shown in a special exhibition at Ara Pacis Museum in Rome, and has been exhibited at Padiglione Italia at Expo 2015 in Milan. Fashion and Sports Laura and Lavinia Biagiotti were the first to establish a bond between fashion and sports, with the aim of strengthening two great sectors that promote Italian excellence worldwide. For the striking finale of her show in October 2000, Laura Biagiotti welcomed many of the champions of the Sydney 2000 Olympics and had them walk down the runway wrapped up in a cashmere Italian flag. The bond between Biagiotti fashion and great athletes has continued over the years with exceptional testimonials.Laura Biagiotti was the first Italian fashion designer to invest in golf: in 1991, she inaugurated the Marco Simone Golf Club, one of Italy’s most beautiful golf courses right outside of Rome. The 27-hole golf course is built on 150 hectares of Laura Biagiotti’s castle grounds, and its 7,000 square meter Club House is the largest in Europe. It hosted the Italian Open in May 1994.Marco Simone Golf & Country Club will be the host venue of the 2022 Ryder Cup match which will be played for the first time in Italy. FragrancesLaura Biagiotti is well-known all over the world for the success of the fragrances: the first perfume, Fiori Bianchi, was launched in 1982 and was followed by Roma in 1988 and by Venezia in 1992. Laura and Roma Uomo made their debuts in 1994. Aqua di Roma, winner of the Fifi Award, was launched in 2004. In 2010 Mistero di Roma made his debut. Essenza di Roma has been launched in 2013. The Roma fragrance, a classic best-seller around the world, celebrated its 25th anniversary in 2013. Blu di Roma has been launched in 2014. In October 2016 Laura Biagiotti Roma Passione has been launched.